Time efficiency is an absolute necessity for most businesses today. Working smarter, not harder, is something that everyone strives to do. Now, with the integration of your alphanumeric paging service and the premier dispatching services of Total Recall Message Center, Inc., alpha paging is easier to sell than ever before. Our friendly dispatch agents and innovative features can help you generate more sales, better service and higher profits! Total Recall offers numeric and alphanumeric paging support for all sizes and types of paging carriers and resellers. As an expert in this field, our goal is to expand the versatility, utility, and value of mobile communications for your customers. By offering excellent services, reliability, and reasonable rates, Total Recall makes message sending easy for your customers - and a profitable, value-added service for you. Total Recall sells its services on a wholesale basis to carriers, manufacturers and resellers, who then brand and sell our services as their own. This wholesale model allows Total Recall to work on a non-exclusive basis for the full spectrum of wireless providers. It accords the carriers the ability generate revenue, without development or overhead expenses. Standard Dispatch Service works well for any size company and for individuals who need an easy way for callers to reach them. Full-text messages are dispatched by name or pager number by our friendly, helpful dispatch agents, 24 hours a day, 365 days a year. Access for callers is toll-free via a common toll-free number from anywhere in the U.S. and Canada. All messages are numbered sequentially so that subscribers know if they have missed any messages and need to utilize toll-free message retrieval. When Personal Messaging Service is chosen, an exclusive toll-free number is provided for the use of the individual. Because calls are answered with a greeting specifically for your subscriber, this is a great service for anyone that prefers personalized service. Customized Greeting Service offers individual subscribers the benefit of a toll-free number and a personal greeting recorded in their own voice. The recording is followed by an automatic prompt for the caller to connect to a text messaging operator. The operator transcribes the caller's message and sends it to the subscriber's wireless device. Personalization and simplicity at its finest. Corporate Messaging Service is the perfect customized solution for any size business with multiple pager users. With this service, an exclusive toll-free number is provided for the use of the corporate account. Calls are answered by dispatch agents with a custom greeting identifying the name of the corporate account. All pager users in each corporate account can be listed under a single database. Additionally, we can establish custom database records to indicate departments or locations. Corporate Messaging Service provides professional call answering and processing when you need custom solutions for your major accounts. Our system stores up to 100 messages sent within the last 5 days. All messages are numbered sequentially so the subscriber will know when a message has been missed. 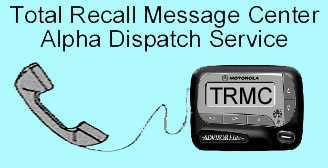 subscribers may call a Total Recall dispatch agent to retrieve missed messages. Subscribers may request to have up to three messages read back by a dispatch agent. Because messages can be sent to more than one person in any number of cities with just a single page, group messaging provides an ideal way to enhance national account opportunities! There is no limit to the number of groups to which any pager can belong. Group set-up is done through customer service and there is no charge to set up a group. Charges accrue as one transaction each for each pager receiving the message.